The failure or malfunction of many transformers or similar equipment can be directly attributed to the lack of proper control of the level of moisture entering the equipment. It is essential, therefore, that a very low level of humidity is maintained in the air space in the top of the conservator tank to avoid deterioration of the insulating properties of the cooling medium. Transformer breathers provide an economic and efficient means of controling the level of moisture entering the conservator tank during the change in volume of the cooling medium and/or airspace caused by temperature changes. However, with a new moisture content specification of oil being kept at less than 35 ppm moisture (ASTM D-1533 test method), higher performance desiccant than silica gel is needed. ZEOZORB transformer breathers exceed the ASTM D-1533 testing specifications and out perform silica gel breathers by over 75% at average operating temperatures 77°F. In addition, testing shows that if the free air volume above the conservator tank oil is kept very dry, below 100 PPM it will actually liberate and pull moisture from within the transforming insulating lubricant, maximizing performance and life. This dynamic is crucial to optimize operations and maintenance procedures. 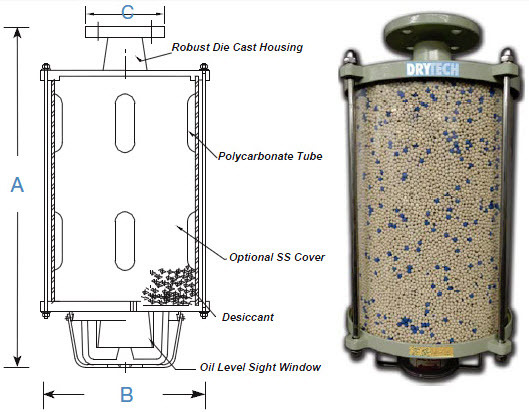 Drytech Transformer breathers reduce the relative humidity levels in a consevator tank to less than 5% RH. Air entering the breather is filtered and dried. Air expelled through the breather is filter through an activated carbon filter, prolonging the life of the breather. ZEOZORB transformer breathers are made of robust cast aluminum and UV resistant polycarbonate tube. ZEOLITE adsorbent provides up to 28% by weight adsorption and provides clean dry air less than 100 PPM. ZEOLITE also maintains performance in high temperature environments, unlike Silica Gel. 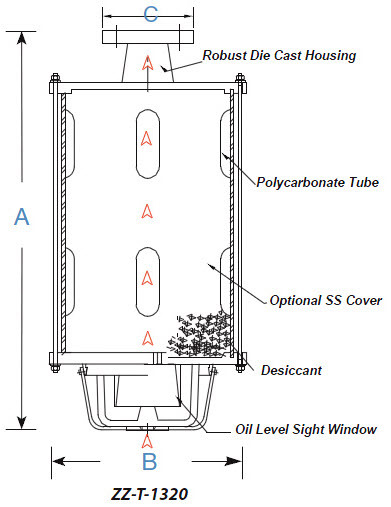 All ZEOZORB transformer breathers use a visual sight window to indicate when replacement is necessary. To replace, simply empty the spent breather contents and refill with new desiccant. Optional protective stainless steel and expanded metal housings are available for additional protection. Transformer breathers are offered in a variety of NPT/BSP and flanged connections. When maximum adsorption is reached, the blue indicating ZEOLITE beads will turn from blue to beige, to indicate that a replacement is required. N/A Drytech Transformer Breathers operate as your first means of protection againt moisture contamination. Transformer breathers take the approach of filtering atmospheric air BEFORE it enters your equipment, rather than trying to take moisture out AFTER it has been introduced into a system. © 2014, Drytech Inc., Inc. All rights reserved.